"This is a quick but company-worthy cobbler. So simple, yet wins rave reviews. If desired, use 2 (32 ounce) cans of peaches in place of fresh peaches. If doing this, use peach syrup instead of water and then omit the white sugar from recipe. Also, yellow cake mix can be substituted for the white." 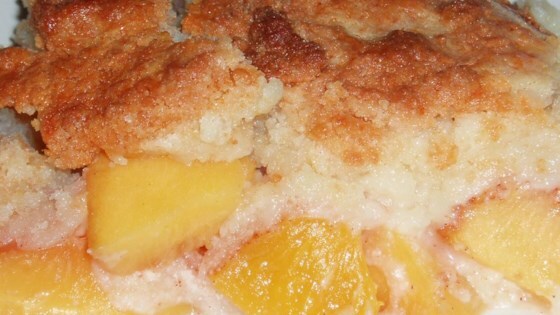 Spread peach slices evenly into a 9x13 inch baking dish. If using canned peach juice, pour 1 cup of it over peach slices. If using fresh peaches, combine water and sugar in a small bowl. Stir to dissolve, then pour mixture over peaches. Sprinkle cinnamon over peach slices, followed by dry cake mix. Top cake mix with pats of cream cheese. Dot cobbler with butter or margarine. Bake in preheated oven for 45 minutes, until golden. Sweet, simple, peach dessert ready in under an hour.